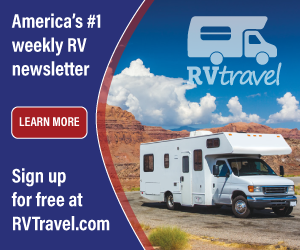 How do you remove the RV windows so they can be re-sealed on a Southwind Class A motorhome. The coach is 27-feet long. 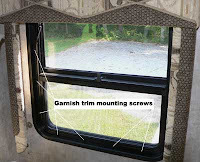 Dave, from inside the RV, remove all the screws around the inner frame – also called the trim garnish (see photo). The window is not really screwed to the wall of the RV. The sidewall is actually "sandwiched" between the outside window flange and the inside garnish trim. Take care when removing these Philips-head screws. Avoid using an electric or pneumatic screwgun since it is easy to strip the head. After the inside aluminum trim is removed, carefully apply outward pressure to the edges of the window frame while a partner holds onto the window from outside and slides a flat putty knife along and under the exterior flange. Eventually the window will push all the way out. Be sure to remove absolutely all the old sealant and clean both the outside of the rough opening in the sidewall as well as the back side of the flange around the window. Use a good quality butyl caulk or putty tape (I recommend Eternabond tape), and apply more than enough to the flange so when the window is reinstalled it will squeeze out around the entire perimeter of the frame. Insert the window into the opening and be sure to "center" the window vertically and horizontally; use shims to raise the assembly if necessary. Tighten the screws through the inside trim in a cross pattern much like you would tighten a wheel assembly. Avoid gaps in the sealant that would permit water entry. Next, carefully trim away the excess and apply a very thin bead of clear silicone across the top and around the upper radiused corners of the window. Smooth out this bead of silicone by wetting your finger and carefully sliding it over the sealant. Avoid rain or washing the coach for 24-hours.